Cornell University Library celebrates its acquisition of a spectacular collection documenting America ’s native peoples. Purchased from the Huntington Free Library in the Bronx, New York, the Native American Collection arrived at Cornell in 2004. With more than 40,000 volumes and thousands of manuscripts on the aboriginal peoples of the western hemisphere, the collection is among the most distinguished of its kind in the United States. 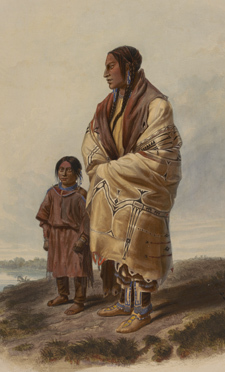 Now the centerpiece of Cornell University Library’s extensive holdings of materials on American Indians, the Native American Collection offers a magnificent array of documents supporting inquiry into almost any topic relating to indigenous peoples, from the pre-contact era to the present day and spanning the hemisphere from the Arctic circle to the southern tip of South America. Vanished Worlds, Enduring People highlights the great range and depth of Cornell’s Native American Collection, and the university’s commitment to dialogue and learning centered on native cultures. The exhibition features many of the collection’s finest books and manuscripts, as well as photographs, artwork, and related materials covering a period of more than four centuries. Included are published accounts of early encounters with native peoples, stunning illustrated books depicting native communities and leaders, documents that preserve the history of native languages, manuscripts that record the work of early anthropologists and those who fought for native rights, and materials that record the histories of tribal communities. Cornell University Library dedicates this exhibition to the indigenous people and communities whose voices we seek here to preserve. We hope the collection will expand our understanding and enhance inquiry and debate for native and non-native audiences alike. Note: Ethnonyms in this exhibition preserve the words used in the texts themselves. As a way of recognizing that Europeans sometimes corrupted the tribal names they heard and that usage changes over time, label text also includes, between parentheses, names that native people use to identify themselves today, e.g., Delaware (Lenni Lenape).